A CBT-based approach to helping your teenager manage his/her anger. 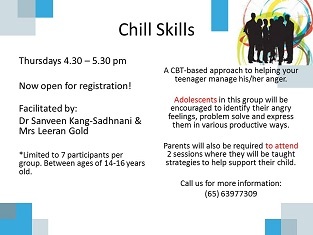 Adolescents in this group will be encouraged to identify their angry feelings, problem solve and express them in various productive ways. Parents will also be required to attend 2 sessions where they will be taught strategies to help support their child. *Limited to 7 participants per group. Between ages of 14-16 years old.